This weekend was the very last one which had leaves abundant on the trees. They are now bare. This photo filled with the bright light of the late afternoon sun and the yellow leaves lining the back of our property will be the what sustains me through the now gray and wet days of late autumn into winter. I can feel that chill in the air! I got quite a giggle when both Cole and Louis greeted my idea of clearing the leaves with the separate comments that it was "man's work" and that I should stay inside. Um. Okay, I'm good with the idea of man's work, but I'll be outside with you, taking photos of course! I don't know how many times they filled up that blue tarp and dragged it out front! We have a crazy amount of leaves. Well, we did. They're now on the road ready for pick-up. We had a spectacular weekend here in Southern Ontario. The temperatures were around 15*C and the days were sunny and bright. An incredible display of autumn splendour ... hopefully the memories of this weekend can stay with us during the sure-to-be-chilly weather that is on it's way! Through 2009 we put up with a number of months of construction on the busy road by our house. It is a busy, particularly during rush hour, and you have to cross it in order to get to the spacious park and gorgeous gardens. The finishing touches have been completed so I headed over with the kids yesterday to take a few photos. Not only was it lovely here at home, the news from Lake Placid was thrilling. 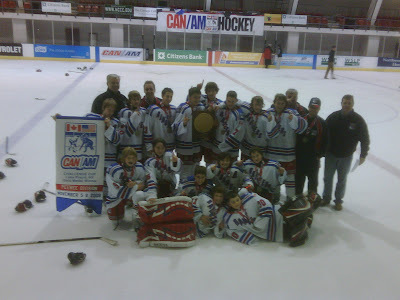 Cole and his team went to the Can Am Challenge Cup and competed in the PeeWee division (players born in 1997 for the uninitiated!). They played a total of five games and outscored the competition 26-1 to earn a spot in the Gold Medal Finals. This came in early Sunday afternoon. Louis has learned how to use the camera on his Blackberry ... which is crappy quality, but wow, so happy to have it! Cole is holding the plaque - click on the photo and squint, it may focus better :) So proud of the boys. It's so hard to stay focused and strong when you're winning by such a huge margin every game. So, though I took plenty of lovely photos, this fuzzy one sent by way of my husband's Blackberry is by far the one that means the most to me. It is my best shot, this Monday. This is quintessential autumn: some grey, some wet, some leaves. Not much makes me happier than the look on Claire's face when she sees something beautiful. She positively lights up, grabs her camera and she's off to where her becoming-trained eye takes her. This week it took her to the end of the property where she could see the sunrise over Lake Ontario. The sunrises are becoming increasingly spectacular as the temperature decreases. I have no doubt Claire will have a whole album worth of orange and blue photos by the end of the season. What is your favourite Straight Out Of Camera shot today? Join in here. The talented Sue Sykes, of JustCre8 and Canadian Scrapbooker Magazine has a new adventure to fill her time: a challenge on a new section of the Canadian Scrapbooker Magazine website called Hands On Photography. Each month she will post an assignment and we have a month to submit our homework. This month there is an opportunity to win a delicious collection of Rose Moka goodies. Head on over and check out the challenge: here. Given the number of sporting events I attend, through September, I have many opportunities to participate in this challenge. I have plenty of fast shutter speed and slow shutter speed photos, but I have none taken at the same event for comparison purposes. What a great learning opportunity! I wonder what I'll discover? While washing the dishes this was the view that greeted me out the window. Totally appropriate to represent our very wet summer! What is your Best Shot Monday? Do you have one that represents your summer so far? If so, let me know and send me a link! Technically this is a terrible picture given that it isn't what I wanted at all. BUT it is one of those surprises I often find on the card when I upload to my computer! Yesterday was Chloé's final performance at Appleby Theatre Arts camp. She has loved her two weeks of camp and is already angling for a couple more! The three arts camps (theatre, dance and visual arts) join to present a play written by the children during the week at camp - actually, the four days of camp since the performance is given on Friday in the early afternoon. This week they worked with blacklight. Hard to photograph, but lovely to watch! There's a spooky oak tree next door, spooky because it is very old, knarled and poor Tom (neighbour) has spent a silly amount of money - his phrase, on trying to save it. It makes for a great backdrop when we have a full moon. Well, almost full, 98% as of 9:45 tonight. We had a wicked thunderstorm on Thursday. It shut off the electricity and really freaked out the kids on their last day of school. It brought new meaning to the phrase, "out with a bang!" This is the view out my front stairwell looking to the street. It's exactly what I saw as I looked out the window. Photos are so rarely exactly what we see! What is your SOOC for today? Let's see! Lately I've been taking many photos of plants. They are the perfect subject for photo experimentation. It may be the joy of spring, the celebration of new life. Who am I kidding? I love my flower friends because they don't give me goofy faces, they stay still, they always put on a pretty face, they don't fight, don't squint in the light. For photo practicing, I far prefer my flora friends than my children! In this case, I was attempting to get a dark background, though you can see it's a very bright day for the shot. It worked! It worked! At least, I think it did. What do you think? Other than cropping or possibly straightening the horizon using iPhoto, there is no post-production on my photos. The reason for this is two-fold: intimidation and lack of time. I was thrilled to find SOOC Saturday by way of Tracy Clark's My Best Shot Monday. Claire was called upon to pitch this week at the Burlington game vs Milton. Her first time on the mound since last season. She was incredible. Three up; three down; eight pitches. 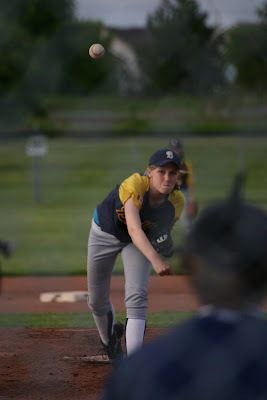 She is a really good baseball player and a real contributor to her team. You can't ask for much more than that. So proud of our girl. Join in and let me see your Straight Out Of Camera shots!